Life in the back of beyond has been quiet since boxing day, all thanks to the flu virus that has knocked Mr VanderCave and I literally off our feet. All baking has been suspended whilst we have been busy getting through copious amounts of cold and flu remedies, throat lozengers and tissues. Finally, today I think I saw a light at the end of the tunnel when my mind started wandering towards the lovely cookery books I got for Christmas. 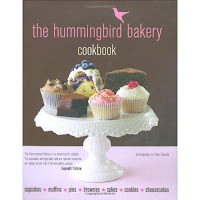 I was lucky enough to get two Hummingbird Bakery recipe books, which are both packed full of recipes that I just can't wait to try out! 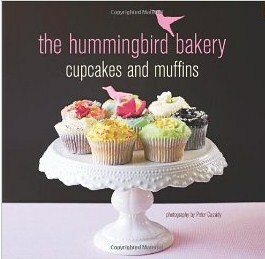 I was quite surprised when reading some of the recipes about the small amounts of butter used for the cupcakes. Call me old fashioned but I am a devotee of the old 4,4,4,2 (equal amounts fat,sugar, flour, half the amount of eggs) approach to sponge cakes. 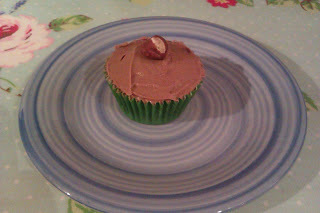 I decided to put my skepticism to one side and have a go at the Chocolate and hazelnut cupcake recipe. Any thing with Nutella in is ok by me! 40g butter, at room temp. 3. Pour the milk into the mixture and mix. Then add the egg and beat until it's all incorporated. 4. Spoon the mixture into cupcakes cases in a muffin tin, filling to about halfway or 2/3 full. They rise quite a bit. Bake for 15-20 minutes until springy to touch. 5. Leave to cool completely, then cut out a little circle in the cupcake. Pop the loose piece of cake out, insert a dollop of nutella, then put the cake piece back ontop so you have a filled cupcake. Mix all the above ingredients together until incorporated and continue mixing for about 5 minutes. The more mixing, the fluffier the icing! Use a palette knife to ice the cupcakes, then add the whole hazelnut as a finishing touch. I have to say I was pleasantly surprised by the outcome.The sponge was moist, light and airy, and the frosting was creamy and smooth. The addition of the nutella in the middle makes these cakes a Nutella lovers idea of heaven. This recipe is a definitely a keeper and I looking forward to trying out other recipes from the books soon!